ADA can handle any kind of appraisal assignment. We do auto, heavy equipment, motorcycles, SUVs, RVs, boats, airplanes, bicycles, off road equipment, farm equipment, and even golf carts. We offer on location presence that is able to determine cause and coverage, objective appraisals - no assuming of damage or "just in case" allowance, and automated appraisal with digital photos. We offer the highest quality appraisal services covering New Mexico, Colorado, and Texas. We are not a network. When you assign a claim to us – we do the work not someone else! Our appraisers are credentialed and experienced. ADA of the Southwest provides claims and inspection services which include auto/heavy equipment damage appraisals. Our appraisers and firm are members of IADA, New Mexico, Colorado, and Texas Claims Associations, ICAR, and ASE. Our people have hundreds of years combined experience in claims handling. 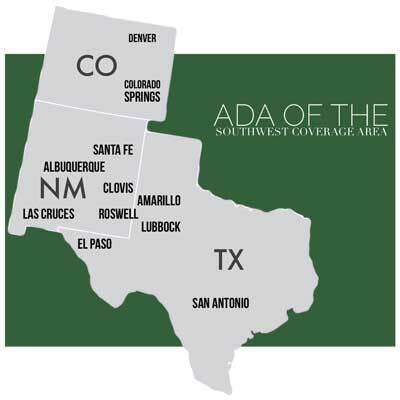 ADA of the Southwest has been in business since 1952. What sets ADA of the Southwest apart from the rest of our industry? We are independently owned and operated and have been under current ownership since 1986. All of our claims are dispatched from our home office in Albuquerque, NM which allows us to status our claims effectively, keep track of turn around, and to use our staff as effeciently as possible. Most times you can be connected to the appraiser in the field directly through our home office. We do auto, heavy equipment, motorcycles, SUVs, RVs, boats, airplanes, bicycles, off road equipment, farm equipment, and even golf carts. Our staff is the most experienced in the southwest. This means you don’t have over written estimates and or large supplements. Do you know why clients stay with ADA of the Southwest year after year? We have the most experienced appraisal staff and the most efficient inside staff in the region. Our staff handles the toughest assignments. Since 1952 we have strived to meet the needs of an ever changing claims environment. We’ve kept up with the technology that allows us to move staff anywhere they are needed and to upload the files in any system our client desires.